Do not trust these deceptive words. Ancient Israel believed they had carte blanche with God’s approval. Not unusual. Especially among nations that are enjoying a modicum of political and financial success. “God bless America” we hear so often in political speeches, implying that we have a special dispensation from God. Ancient Israel’s mantra was “the temple of the Lord, the temple of the Lord,” as they looked proudly at the gleaming place of worship they associated with God’s dwelling place. “Nothing bad could happen to us because we have the temple of the Lord” was the upshot of this phrase. Believing that life will go on as usual is a deadly assumption. Good examples of nations that thought they had the tiger by the tail litter history, but they are now just historical footnotes: Assyria, Babylonia, Persia, Greece, and Rome are just a few examples. 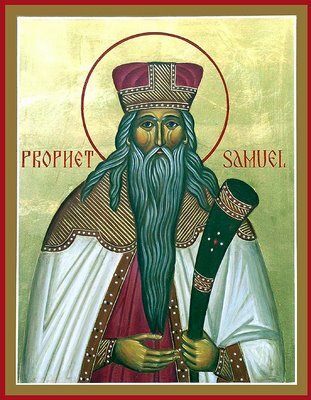 Long before Israel was chanting “the temple of the Lord” and before they had a king, a young man named Samuel was being groomed to be a prophet for God. His tutor was an old priest named Eli. Young Samuel’s sleep was interrupted one night by a voice calling out to him which he later discovered to be God. The message was about historical disruption and change. It was about shock and awe. Ears tingling. And that’s what happened. The piece of furniture that Israel associated with God’s presence (pre-Temple) was stolen by the Philistines and placed in a temple to the Philistine god Dagon. Good priest Eli’s evil sons died in a battle with the Philistines. And when Eli got the bad news, he fell off his chair in shock and broke his neck, immediately dying. To add insult to injury, Eli’s daughter-in-law died in childbirth leaving behind her now parent-less child. The editorial page of the Shiloh Herald asked how Israel would get over the loss of Eli. It spoke of a national depression and speculated about what Israel’s next political step should be. Many wondered if Philistia would invade and take over their nation. Ears were tingling. Ears still tingle. God says and does surprising things. “I’ve had enough of your burnt offerings,” he once told Israel. “Instead, learn to do good; seek justice, rescue the oppressed, defend the orphan, and plead for the widow.” Not exactly what they expected to hear. The biggest ear-tingler was the Incarnation – Jesus living among us. It was shocking at several levels but the most shocking was the way that Jesus turned over all human assumptions about what God cares about, whose side God is on, and how God has a preference for weakness and humility rather than power and aggression. Israel did not get what they expected. I suspect that when we say “God bless America” what we assume and what God intends are two different things. Especially when we would prefer a good ceremony or praying over a new military device versus helping feed a hungry person or loving an enemy. Say that out loud and ears will tingle. ← Previous Post They worshiped, but some doubted.